Discussion in 'Cooling Systems' started by DorianL, Jun 6, 2018. Hey All… When I take the car for a drive, within a mile I go over 230 to 250 rapidly; barely enough time to reach operating temp. I pull over immediately and shut down. Thirty seconds later, the temp drops fast when I turn the engine back on. Then, either creeps up fast again, or stays at thermostat/normal levels. My thermostat is about new and has a few holes punched in the flange. (I have squeezed the thermostat hose - it feels/sounds like there is air in there and it isn't scalding hot. I'm not sure if that is normal.) Note: I just swapped intake manifold. As I could not remove the pipe plug on the manifold, I disconnected and plugged my hose going from the water pump to my heater core. The plugged hose from the heater core was left full length and is hanging on the wheel well. (I am suspecting air trapped somewhere?) The temp sender is in the cylinder head. Yes I think your right there is air trapped in the cooling system. If there is another plug on the intake to remove for a bit, pull it. Fill the radiator or from the expansion tank. Let the coolant run out. Air will be pushed out. Put the plug back in. Make sure the bottom radiator hose is not collapsed. I was using Moroso water restrictor plates till early this spring in the 63 Pontiac. Really work nice in the summer heat. Old radiator was just barely adequate. Bought a New Griffin Pro series Race aluminum radiator. Huge. Using a 160 F Mr. Gasket Race T- stat now. 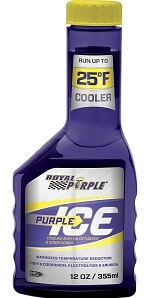 Removes all crap grime & corrosion inside of a cooling system. They sell it At Wally World Wal Mart here now. and Id test the t-stat by simply removing it for a 15 minute,drive to see if it changes the way the engine heats up and the time frame, involved. Loves302Chevy "One test is worth a thousand expert opinions." Do the test Grumpy mentioned by removing the thermostat. While it is out, do the boiling pan of water on the stove test to the thermostat. If you warped it any while drilling the holes, it would act "sticky". well? did you pull the t-stat and test drive ? 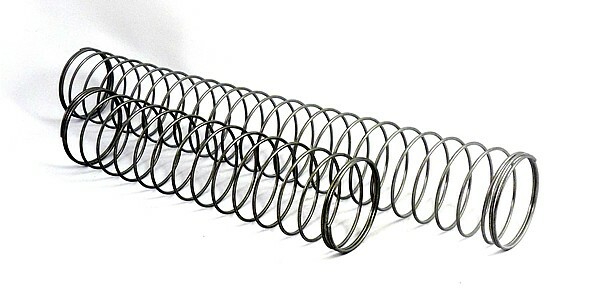 did you install an internal structural support spring in the lower suction radiator hose? I was planning to this weekend, but then I got absorbed by another project. Did a little testing this evening. The lower hose in not collapsing and the coil inside feels in good shape. There does seem to be a lot of air in the upper hose. Ok, so I tinkered a bit with the 'vette yesterday. I am beginning to lean toward a sticking T-stat. This bothers me as the T-stat is new. I found a protocol for bleeding C3 corvette coolant. It involved 3000 rpm runs with and without the radiator cap (which is on the expansion container). It feels like most of the air is out of the system. Nonetheless, the temp climbs to 230... then suddenly drops to operating temp. I just don't understand how a new T-stat that was working fine all of a sudden sticks. Was it the holes a drilled? I barely used any RTV - a thin film to me is just that. I am not a big fan of RTV squeezing out all over the place ...and inside. Before you ask... remember that finding another T-stat is typically an hour drive up and another back ...if they have it in stock. Just make some restrict-or plates with different size openings out of scrap 1/8 aluminum plate befor trying another t-stat to find out if you have another problem causing the issue. by simply temporarily removing it and driving the car? Gasket. I have only one gasket. This is belgium; another may not be immediately available. I’m trying to be as sure as possible before I make that move. Exhaust all options. But that is indeed what I’m about to do as it cools. I just did a test now. Now again, after swapping the intake and drilling holes in the flange of the new t-stat, the problem came back. I’ll test that one too once it is out. Just a few minutes ago I ran the engine for a few min. I broke out my laser temp sensor and, pointing it at the t-stat housing, clearly only when I shut off the engine did it open and open immediately; the temp rose in the housing and hose. I wonder if I installed the t-stat upside down? We are about to find out ! Once the engine is cool enough, I’m popping off the housing. I scooted up the support wire so that it reaches the tightest bend and I trimmed off quite a bit of the lower hose. the question remains... does the car run cooler when you cruise, and without the heat build-up with the t-stat removed ? Well, the job is done. Hose is streamlined. The housing is reinstalled without the thermostat. As much as I want to dump the coolant back in and test it, I think the wise thing to do is let the RTV cure overnight. #frustrating.